When I was a kid, anytime I got a bad sunburn—aka literally every family vacation—my mom would head to the drugstore and buy a lotion with “aloe vera” slapped in big letters on the front of the bottle. Ever since, I’ve always known that any time I had red, angry skin, I just needed to look for some kind of product with aloe vera—specifically, the thick, clear liquid inside the leaves of the aloe vera plant—in order to find some relief. But recently, I’ve noticed it in a different aisle at the grocery store: the beverage section. Because apparently, drinking aloe vera juice can have its own benefits, too. Wondering why someone would want to drink this stuff in the first place? Keep reading for eight reasons why it’s beneficial, possible side effects, and a quick recipe so you can try it at home. What are the actual aloe vera juice benefits I should know about? 1. It’s good for digestion. This is the major reason why someone might start incorporating aloe vera juice into their diet, says registered dietitian Melissa Rifkin, RD. “Aloe vera juice helps to maintain the ‘good’ bacteria in your gut to keep your gut flora balanced,” she says. “Having balanced gut bacteria can improve overall digestion and feeling bloated or gassy.” She says it can also be helpful for people who struggle with constipation, since it’s high in fiber and boosts the water content in your intestines—pushing everything through more effectively. But she says that it should be consumed in small portions (no more than two tablespoons a day) because in excess, it could cause diarrhea. 2. It can help relieve heartburn. “Those with heartburn can also benefit from aloe vera juice due to its alkaline properties,” Rifkin says. “It can help neutralize acid in the stomach.” If heartburn is something you suffer from regularly, talk to your doctor to see if it’s something you should incorporate into your routine. 4. Aloe vera is super nutrient dense. Besides its beneficial digestive properties, Rifkin says that aloe vera juice is also full of nutrients. “Aloe vera juice contains several important vitamins and nutrients, such as vitamins B, C, E, and folic acid,” she says. Vitamin B is crucial for brain health, vitamin C keeps the immune system running properly, vitamin E is linked to protecting against cancer, and folic acid lowers the risk of heart disease and stroke. Quite the resume of health benefits, right? 5. It could stabilize blood sugar. 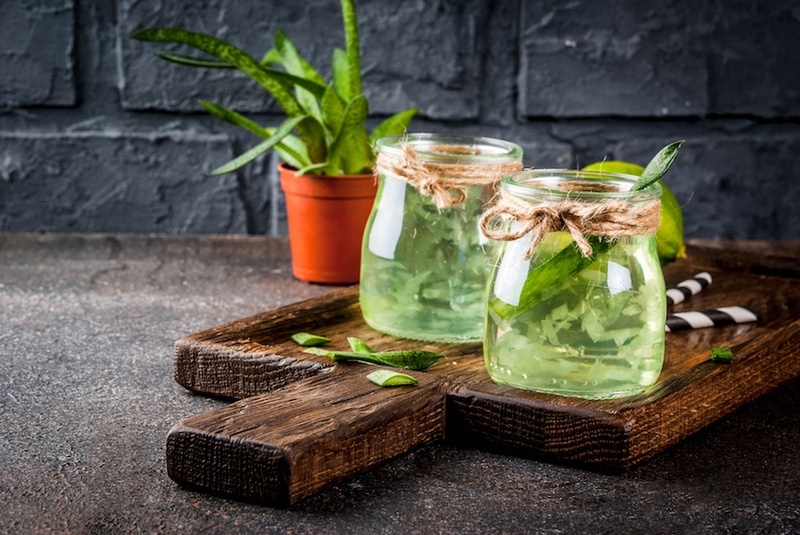 “Studies have shown that those with type two diabetes can benefit from drinking aloe vera juice to help control their fasting blood sugar levels,” Rifkin says. It’s been shown to be beneficial to people with pre-diabetes for this same reason, too. 6. It’s good for gum health. Drinking aloe vera juice is doing your body good even before you swallow it. Studies have shown that it’s good for your gums because of its antiviral properties. 7. It helps increase collagen production. You might have heard that collagen is the key to looking like you never age. Well, consider pairing your collagen with aloe vera juice. It’s been found to support collagen production, reducing the appearance of wrinkles. Are there any risks or side effects of aloe vera juice? Remember the whole “too much aloe vera could give you diarrhea” thing? Yeah, that’s definitely a side effect everyone should keep in mind—which again, is why Rifkin says it’s important to limit intake to just a few tablespoons a day. But there are a few more items in the fine print of aloe vera juice side effects. Rifkin says that it could cause serious drug interactions, so people should talk to their doctor first if they’re on prescription meds before dosing themselves. This is especially important for diabetics; per the NIH, people who are on glucose-lowering meds should avoid taking aloe vera orally (since it could further lower blood sugar levels). Rifkin also says it should be avoided by anyone about to have surgery, because aloe vera could interact with anesthesia medicine. How do I eat this stuff if I want to try it? 1. Combine in a saucepan. If you’re curious about other wellness drinks, here’s what you need to know about celery juice and bone broth.